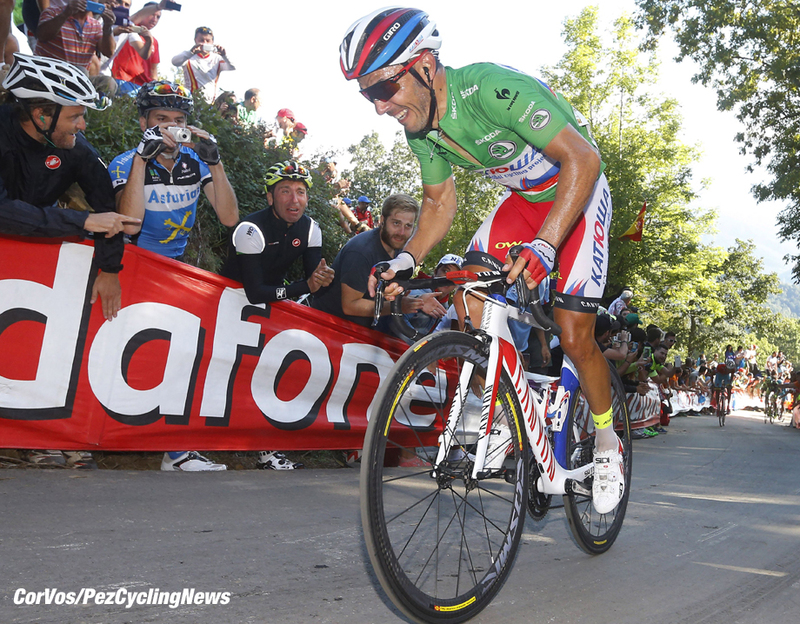 PezCycling News - What's Cool In Road Cycling : Vuelta’15 St.16: Schleck Surprises In Asturias! Vuelta’15 St.16: Schleck Surprises In Asturias! Race Report: Seven categorized climbs with a summit finish, the perfect day for the light climbers to rid themselves of Tom Dumoulin before his specialty of the time trial. Well, it didn’t quite turn out that way, although the big Dutchman is now nearly 2 minutes off the overall lead. Frank Schleck won the stage, at one point his group had a lead of 22 minutes, but the Luxemburger held out for a much needed win. The break went as soon as the flag for Kilometer 0 was dropped: KOM, Omar Fraile (Caja Rural-Seguros RGA) had to be there, he was joined by Carlos Verona (Etixx - Quick-Step), Pierre Rolland (Europcar), Frank Schleck (Trek), and Rodolfo Torres (Colombia), they soon built up a solid lead and on the first climb, the Alto de Aristébano, they were joined by Moreno Moser (Cannondale-Garmin), Cyril Lemoine (Cofidis), Lawrence Warbasse (IAM Cycling) and George Bennett (LottoNL-Jumbo). After the summit of the climb, won by Fraile, Tsgabu Grmay (Lampre-Merida) caught up with them and the lead grew and grew until it was 13 minutes at the Cat 2 Alto Piedratecha after 40 kilometers. Fraile took maximum points again. With 135 kilometers to go the lead was 18 minutes and no one in the peloton was looking to do any chase work. Eventually once the lead topped twenty-two minutes, Katusha began to ride on the front, but fairly half-heartedly. The third climb of the day was the Alto de Cabruñana (Cat 3) and tops after 85.6 kilometers of racing. Again Fraile was first for the maximum amount of points towards his Mountains jersey, the group lost a little time, but still had nearly 20 minutes. Fourth climb of the day, the Alto de Tenebredo (Cat 2), started to ramp up after 116 kilometers and the ten leaders still had 19 minutes in hand on a very laid back peloton. There really wasn’t any rush to do anything about the break as Frank Schleck was the best placed overall at 40:22 in 31st position. If he were to finish 20 minutes up he could make it into the top 20. Again Fraile was first to the top for the KOM points. Next on the menu was the Cat 2 Alto del Cordal after 150 kilometers. The lead had dropped under 19 minutes with Katusha working, but no one was sweating too much, Astana were second in line with Movistar just behind them along with Tinkoff-Saxo. With 35 kilometers to go, the chase would have to go full gas to catch the escape before the finish. As the peloton hit the start of the climb in La Vega de Riosa, Tinkoff moved to the front and the speed lifted noticeably. The escape crossed the summit of the Cordal climb with a lead of less than 12 minutes and Friele was first again. On the descent IAM Cycling’s Lawrence Warbasse lost contact with the group and later his teammate, Sylvain Chavanel crashed as the peloton made the same drop, the Frenchman looked to have broken a collarbone when he hit the barrier. The Cat 1 Alto de la Cobertoria climbs for 9.8 kilometers with a maximum steepness of 13% and an average of 8.7% with a height gain of 855 meters. The nine became four as Frank Schleck put the pressure on and saw off Lemoine, Fraile, Rolland, Moser and Grmay. In the bunch; Astana were doing the same as the Kazakh team tuned the screw bringing the size of the chase down to around twenty riders. All the GC men were still in attendance, although Dumoulin had lost all his teammates. Sky’s Mikel Nieve made an attack, but was left a few meters ahead of the Astana riders who maintained a steady pace. Colombian rider Torres joined Schleck at the front to shake off Verona and Bennett with 2 kilometers to go to the summit. At the top Schleck was first. Astana brought the GC group over at 11 minutes. The climb to the Ermita has a maximum gradient of 21.67% and an average of 11.1% in its 6.8 kilometer length, similar to its cousin the Angliru, but not quite as tough. Schleck and Torres had a few words at the base of the climb, possibly discussing their chances of success, which was looking quite hopeful at this point, 11 minutes advantage with 6.8 kilometers to go? Torres and Schleck shared the work evenly, although it looked like Torres might be the stronger of the two on the steeper sections. Through the mountain village of Bárzana, the two leaders were holding the gap at 10:27 on the GC group of twenty with Astana still keeping the speed high for Fabio Aru. On the first bend, Poljanski of Tinkoff-Saxo attacked, but he was looking back to see if there was any reaction, there wasn’t and he was pulled back by the Astana men. Up front, Schleck dropped Torres as the road kicked up with 3 kilometers remaining; he quickly put fresh air between him and the Colombian. Into the last two kilometers and the Luxemburger still had 10 minutes in hand as the climb eased off to only 14% and 10% sections! The fans were out to cheer Frank to his biggest win for quite a while. He crossed the line holding his neck pendant in the air. The red jersey, Fabio Aru, looked in trouble, as did Valverde, both sat at the back of the group. Valverde was distanced as was Esteban Chaves, but Tom Dumoulin was holding on and riding next to Aru at the back. Eventually Dumoulin lost a couple of meters on a steep section, but he pushed hard and managed to hold the back of the group as Joaquim Rodriguez’s Katusha teammate Dani Moreno lost contact. Dumoulin went through all sorts of pain barriers to keep the group in sight, but as Rodriguez attacked with 600 murderous meters to go, the Dutchman lost his grip. Purito could see the finish line and the overall lead in front of him, as he only needed 1 second on Aru. The red jersey jumped after him to try to conserve his overall position, but it was too late by 2 seconds and now Joaquim Rodriguez has the 1 second advantage on Aru going into the second rest day and Wednesday’s individual time trial. Frank Schleck (Trek) said after the finish: "It’s been so long for me without a win. The whole day was long and hard, but I was on a good day. It’s all so fresh still to make big comments... I just know that I owed myself to do well, I worked so hard for this, I deserved it." There are still five stages to go and it's still all to play for. Keep it PEZ! 25. Cyril Lemoine (Fra) Cofidis at 12:12. 25. Rodolfo Torres (Col) Colombia at 36:10.